With all of London’s popular attractions just a short tube journey away and a basement bar full of likeminded travellers – Clink78 is the place to be for backpackers visiting the UK capital. 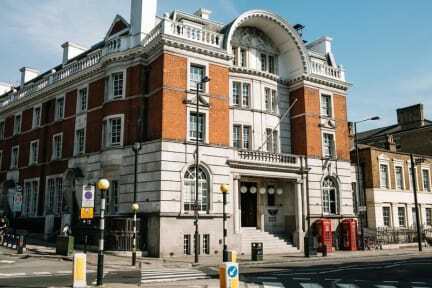 Immerse yourself in London's historic past and soak up the atmosphere at this former courthouse turned lively hostel in the heart of King's Cross. ClashBAR, Clink78’s basement entertainment venue, is the place to head for DJ nights, live music, pool/table football and great drinks deals. If you’re lucky, you can also catch artists creating or musicians performing as part of the hostel’s ClinkCREATIVE program. The ClashBAR is open daily between 6PM and 2AM. As well as our all-you-can-eat breakfast buffet we also offer fresh Pizza from the ClashBAR. Our reception is open 24/7 so there’s always someone available if you need help! 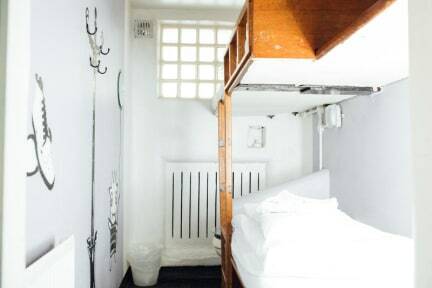 Clink78 offers a mixture of private rooms and dorms, some of which have en-suite bathrooms. All of our beds come with reading lights, USB ports to charge your electronic devices and secure lockers for your belongings. Bed linen is also provided. Every day the hostel serves a great value all-you-can-eat buffet style breakfast for just £3. As well as 24/7 key card entry, each bed comes with a lockbox to keep yourself and all your belongings safe. There are also larger lockers available at reception. Coin-operated washing machines are available at the hostel. 40-minute cycle + washing powder = £4.50. 45-minute drying cycle = £1.50. Кажется мне очень повезло, вместо кровати в 4-х местном номере - получила отдельный номер!